Pinfare allows you to lock in prices on up to 3 itineraries for 7 days- how much would you pay for it? Here’s a common dilemma when booking revenue flights: do you lock in tickets now and potentially miss out on better deals later (or worse, end up with tickets you can’t use), or wait till plans firm up but risk the price increasing? NTUC Income has just introduced an interesting new product called Pinfare that aims to address exactly that. Pinfare’s proposition is this: buy a policy to secure today’s pricing on up to three flights for seven days. This gives you time to firm up your leave and travel plans with your companions. As far as “secure my fare” options go, this isn’t a new innovation. 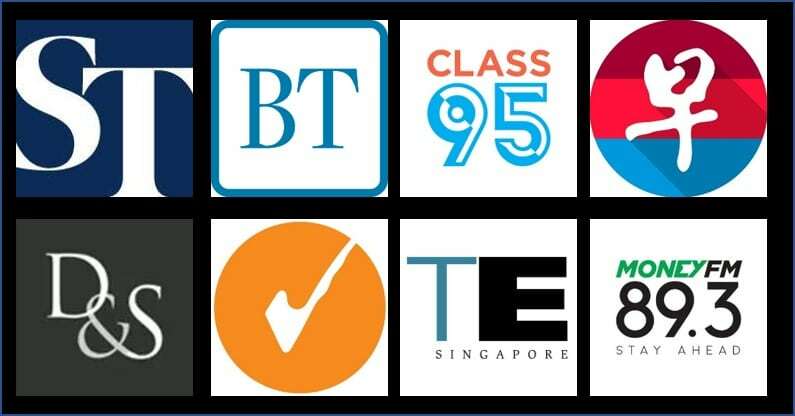 Airlines like Singapore Airlines and Cathay Pacific have offered this feature for a while now. What’s different is that Pinfare allows you to pay one fee to secure multiple quotes across carriers, even on those which don’t have a native “secure my fare” option. I’ve played around a bit with Pinfare and here’s what I’ve noticed. First, Pinfare currently insures round-trip economy flights to six countries: Malaysia, Indonesia, Thailand, Vietnam, Philippines and Hong Kong. There are plans to extend coverage, but in the meantime you’re limited to these six. Second, Pinfare secures flight prices, not availability. That’s to say, I buy a Pinfare policy to lock in a price of $X on a particular itinerary for seven days. There is no guarantee that the itinerary will still be available when I make the decision to pull the trigger. Third, Pinfare protects you if your airfare increases by more than $10 during the period of insurance. You’ll need to purchase the airfare to make a claim- this isn’t like the options market where the underlying asset may never actually be bought. In other words, you can’t “bet on the market” by buying Pinfare policies on flights which price you think will increase, with no intention of buying a ticket (although that would certainly be an interesting game). Pinfare has their own “flight price index” which benchmarks air ticket prices based on Skyscanner data. You’ll be paid the difference between the benchmark/actual purchase price (whichever is lower) and the pinned price. Fourth, Pinfare covers itineraries that depart at least 21 days from today. When looking at budget flights to destinations within South East Asia, I found Pinfare premiums to be pretty reasonable. For Phuket, they were about 5% of the revenue fare. For Hong Kong, it was ~8%. I need to emphasize that I only pulled random dates, so you can’t take these prices as representative. Pinfare premiums depend on a host of factors like how far you are from departure, choice of flights, choice of airlines, departure timings and time of year. You’re going to want to check the quotes for your specific dates and flights. Note that there’s nothing stopping you from pinning airfares to different destinations and paying a single premium. 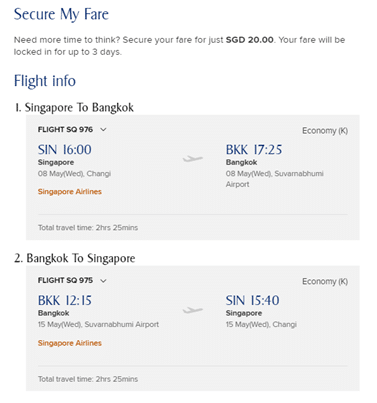 In the example below I’ve pinned one fare for Bali, one for Bangkok and one for Manila. It makes little sense to take that option when I could use SQ’s Secure My Fare feature for only $20. Yes, Secure My Fare is only valid for 72 hours (versus 7 days for Pinfare), but (1) it’s cheaper and (2) it guarantees seat availability. Similarly, I checked out Hong Kong on Cathay Pacific. Pinfare quotes me a $84 premium on a $285 Cathay Pacific fare (30% of the revenue ticket price). 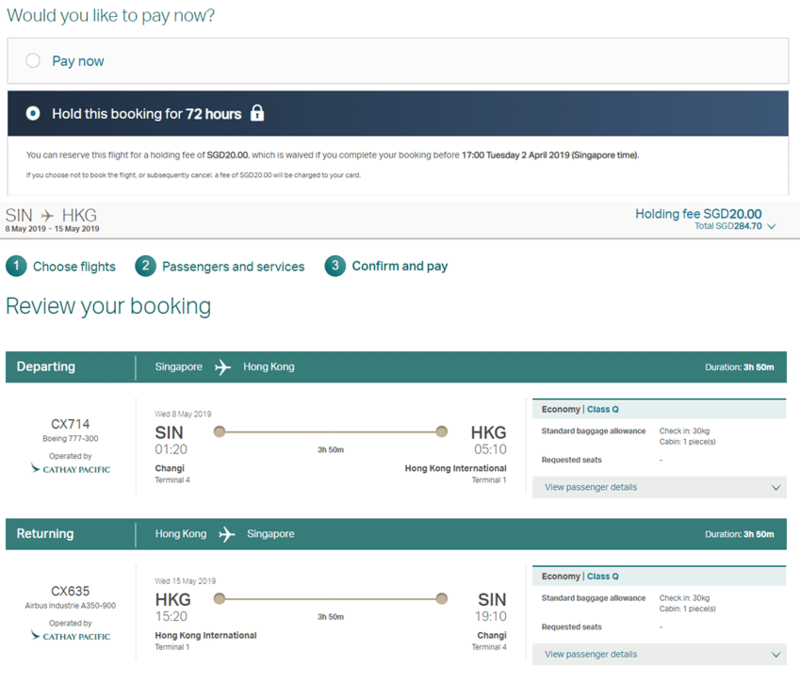 It would only cost me $20 to hold the same booking for 72 hours on Cathay’s official site. And for Hong Kong, about a year out too. The question then becomes whether I’m kiasu enough to pay a premium to secure fares for a flight more than a year out. With that sort of time horizon, there are still numerous alternative flights one could consider. I’m of the opinion that a product like Pinfare has more value in securing flights that are within that awkward 1-3 month window where your alternatives would have narrowed. Everyone’s risk tolerance and appetite will vary, but where flights to South East Asia are concerned, I wouldn’t be willing to pay anything more than 10% of the revenue ticket price as insurance against price increases. I can see how something like Pinfare would be useful for someone looking to buy additional time to make a decision- especially if he/she is flying on a budget carrier in the next couple of months when premium tend to be more reasonable. It’s worth mentioning again that Pinfare does not secure availability, only prices, but assuming you’re ok with that then the product may be worth a look. Isn’t the premium for Phuket and Bali about 5% and 14% instead of 0.5% and 1.4%? thanks for correcting my abject math. When you pin an itinerary with pinfare, so to speak, can you only then purchase it if the same itinerary (fare bucket, fare basis code, blabla) is still available? Or can you still purchase it at the “pinned” price if the fare class has gone up (but seats are still available)? If it’s the latter, I can see a case for pinning a fare when you know only 1 seat is left in the fare bucket, and booking a few days later in a higher bucket with only the premium as outlay (to earn more status or redeemable miles, for example). how if i pinfare refundable ticket ? after get reimbursed and then cancelled the ticket ?